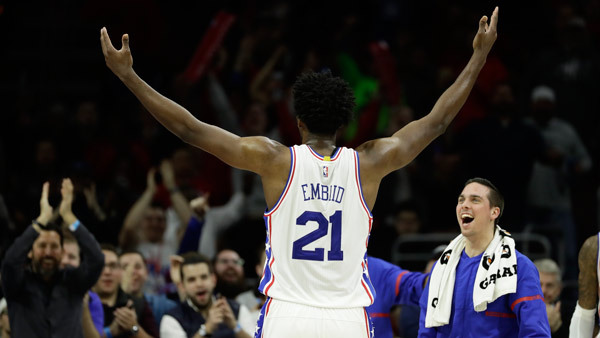 PHILADELPHIA (WPVI) -- The Philadelphia 76ers will get the third pick in the NBA Draft thanks to Tuesday's NBA Draft Lottery. The NBA Draft Lottery took place in Brooklyn. Last year, the 76ers were lucky enough to land the number one pick. The 76ers had a 14.7% chance at landing the top pick. This year that went to the Boston Celtics. The Celtics capitalized on a trade they made with the Brooklyn Nets four years ago. The Los Angeles Lakers were other big winners, moving up one spot to second to hold onto their pick. They would have had to trade it to Philadelphia if it fell outside the top three. The Celtics will go from No. 1 seed to No. 1 pick after their 25 percent chance of winning came through. They open the Eastern Conference finals at home on Wednesday against Cleveland. Brooklyn finished with the worst record in the league but the Celtics had the right to swap picks with them from the 2013 draft-night trade that sent Kevin Garnett and Paul Pierce to the Nets. Phoenix fell two spots and is fourth.